I love reading baseball books. 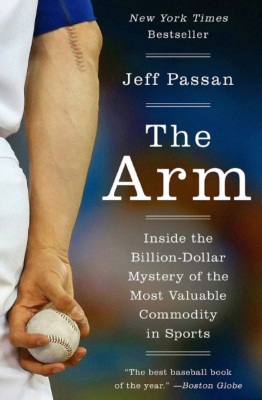 My current read is ‘The Arm’ by Jeff Passan, written in 2016. No, I am not endorsing the book nor recommending you purchase it. Occasionally I run across amazing statistics that are guaranteed to entice a ‘say what?’ response or potentially an even more graphic one. Before dozing off and laying in bed reading about pitcher’s arms who qualify as freaks of nature, I realized that I needed to share a few tidbits. Briefly, this book chronicles the current climate of winning at all costs and what this has done to young and advanced teenage arms as they continue to be pushed by some coaches and parents to throw harder and longer. Tommy John surgery has become common place, as even sixteen-year olds are having this surgery to save a potential million-dollar arm that was abused by an over-zealous travel or showcase team. But that determination is not mine to make nor am I taking a stance. Heck, if I possessed a 96 MPH arm at seventeen years old I would have done anything to be front and center, too. To begin, here are some amazing stats that have been compiled by Jeff Passan and his staff. 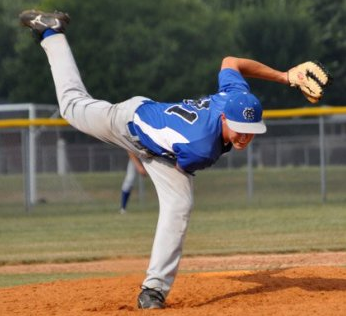 The first baseball game was played in 1846 and a new rule was implemented in 1884 allowing a pitcher to throw overhand, which began our next 135 years of chronicled elbow trouble. Before elbow ligament problems were even diagnosed, which has happened within our generation, there were guys who just went out and pitched through the pain and just assumed it was the price of doing business. One example of this was ‘Old Hoss’ Radbourn who tool advantage of the new ‘overhand’ rule in 1884. Before that time you could only throw underhand or sidearm. He pitched nearly every one of his Providence Grays games that year in the National League (though not 154 or 162 games) while winning 59 games and throwing 678 2/3 innings, of which neither mark will ever be reached again. 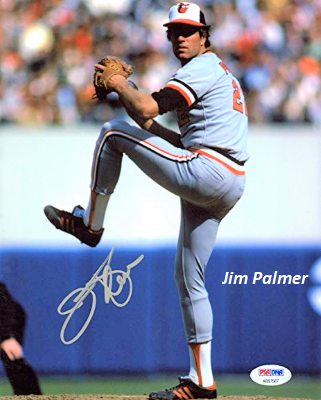 On to more modern times, Orioles Hall of Famer Jim Palmer hurt his arm in 1965 (rotator cuff) but the sports medicine surgery still wasn’t in place like today. He was told to go to Puerto Rico and throw all winter to work it out! Palmer told them what to do with their idea and went to a pharmaceutical company friend who told him to take three anti-inflammatory pills per day. His fastball went from an injured 80 mph to 95 mph and the Hall of Fame. Amazing. 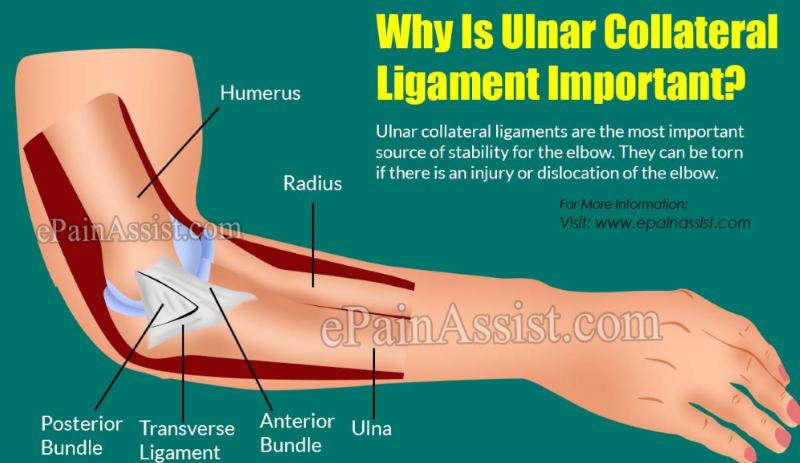 The risky and fragile Ulnar Collateral Ligament (UCL) is located in the elbow and is what needs to be repaired when you hear of Tommy John surgery. Thanks to Dr. Frank Jobe and his courage to try an experimental procedure on then Dodger Tommy John in 1974, they have now shifted the landscape from a 1 in 100 chance of success to a current hourly cattle call of patients to doctors across the country. 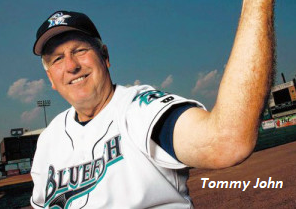 Dr. Jobe was quoted as saying to Tommy John, as he was being sedated on the table, “Tommy, I don’t know what I’m doing.” Well, he knew what he was doing and what took four hours on that day is now an hour-long procedure followed by a 12 to 18-month rehab. Super-agent Scott Boras has called the procedure ‘a rite of passage’ and likened it to an oil change and not to be feared in changing the value of the recipient as being perceived as damaged goods. Sandy Koufax had to retire at the age of 30 because of bone chips and also shoulder problems because his generation didn’t have the tools to keep him going while doing everything he possibly could to pitch every five days, or even more frequently. In between starts his elbow would balloon to cartoonish proportion because of all of the fluid congregating in the elbow joint. The Dodger trainer had to insert a needle to drain the fluid before he pitched. This was caused by three or four spiky bone spurs, that weren’t operated on. He would take the anti-inflamatory Butazolidin the day before, the day after and the day of his start. This drug is intended for horses and has since been banned for human consumption. 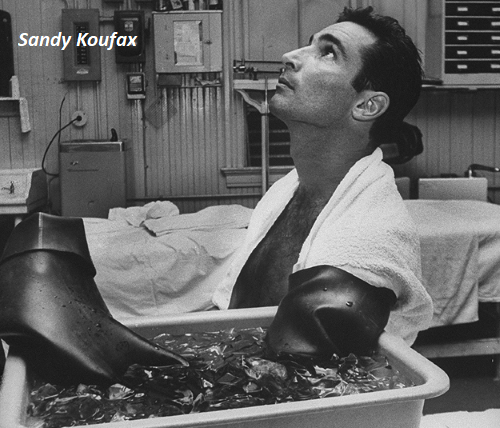 Koufax also had the trainers slip on their rubber gloves and slather on tons of Capsolin on his shoulder and arm. Capsolin includes the active ingredient found in chili peppers, turpentine, camphor oil and other elements meant to punish the body with heat. Koufax needed this to manage his misery. This was no Ben Gay topical we old guys use! His after-game routine of his elbow submerged in the ice bucket, alongside the beer in the clubhouse, is legendary. What I am trying to summarize is that some of the old war horses endured a lot of pain and misery since they didn’t have the solutions the youngsters of today have at their disposal. But is it right to subject our young arms to the stress of more, more, more? I have no idea. But the statistics show that a college pitcher who throws 95 MPH or better has a 27% chance of having Tommy John surgery the next year and then there is no guarantee that you will ever reach that velocity again. I am well beyond 20 years of age and my crooked elbow that resembles a dog’s hind leg can’t break a pane of glass any more. Would I have pushed even harder knowing that I could have the elbow or shoulder fixed like having an oil change? Maybe. I hope some of this is interesting to you. ‘The Arm’ goes into terrific detail and even into the operating room. It should be required reading for any elite-player or showcase team parent of a young teenager and also the athletes themselves. That would at least provide you with the details to answer your multi-million dollar question on how hard to push. Good luck!